L to R: Laura Haney, Briana Figgs, Catherine Weitzel and Peter Sergay. Four Columbia Chamber Singers will be performing on the CBS6 production of “Melodies of Christmas” on December 24 and 25. 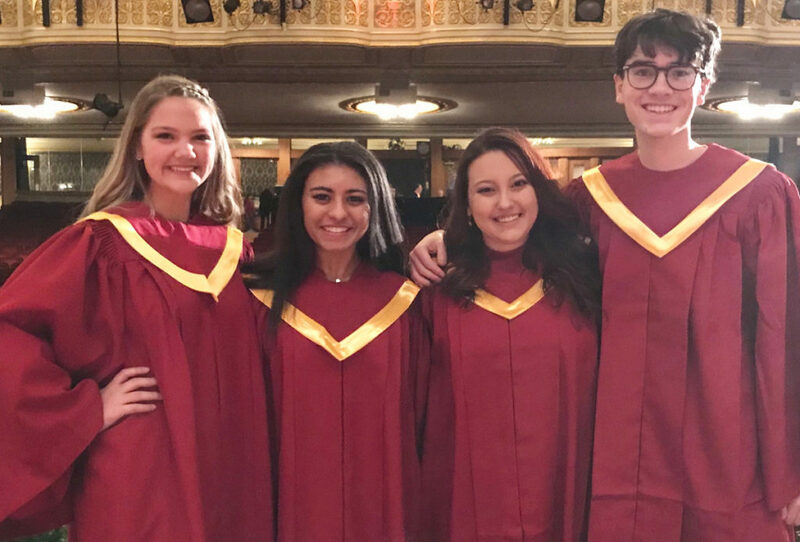 Laura Haney, Briana Figgs, Catherine Weitzel and Peter Sergay were selected for the Capital Region Youth Chorale following auditions. The production was filmed at four live performances at Proctors Theatre last week and will air multiple times on Christmas Eve and Christmas Day. The event benefits the Melodies Center for Childhood Cancer and Blood Disorders at the Bernard & Millie Duker Children’s Hospital at Albany Medical Center. December 25: 5:30-7:00 a.m. and 5:00-6:30 p.m.
December 24: 2:30-4:00 p.m., 7:00-8:30 p.m., and 8:30-10 p.m.